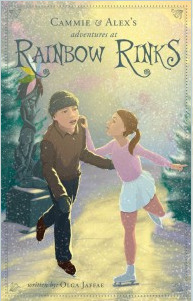 Home > Accessories > Children's Book "Rainbow Rinks"
Eleven-year-old Cammie is one of the best ice skaters at her hometown rink. But when an older girl joins her class, Cammie is in awe of the beautiful sixteen-year-old’s expensive clothes and ability to glide gracefully over the ice. Isabelle and Cammie soon become best friends, and Isabelle convinces Cammie to move to Skateland, a magical place with skating rinks of unusual, enchanting colors. Cammie’s parents and coach are hesitant, uncertain as to whether she is ready to be on her own, but Cammie is captivated by her new life…that is, until everything starts falling apart. Something strange is going on in Skateland—someone is trying to sabotage her chances at a gold medal! With the help of her friend Alex, Cammie must unravel the mystery at Rainbow Rinks and save her skating career before it’s too late!